This kit recognizes natural and some recombinant Porcine C3a . No Significant cross -reactivity or interference between Porcine C3a and analogues was observed. Small volumes of C3a elisa kit vial(s) may occasionally become entrapped in the seal of the product vial during shipment and storage. If necessary, briefly centrifuge the vial on a tabletop centrifuge to dislodge any liquid in the container`s cap. Certain products may require to ship with dry ice and additional dry ice fee may apply. MBS2509360 is a ready-to-use microwell, strip plate ELISA (enzyme-linked immunosorbent assay) Kit for analyzing the presence of the C3a, ELISA Kit target analytes in biological samples. The concentration gradients of the kit standards or positive controls render a theoretical kit detection range in biological research samples containing C3a. The ELISA analytical biochemical technique of the MBS2509360 kit is based on C3a antibody-C3a antigen interactions (immunosorbency) and an HRP colorimetric detection system to detect C3a antigen targets in samples. The ELISA Kit is designed to detect native, not recombinant, C3a. Appropriate sample types may include undiluted body fluids and/or tissue homogenates, secretions. Quality control assays assessing reproducibility identified the intra-assay CV (%) and inter-assay CV(%). 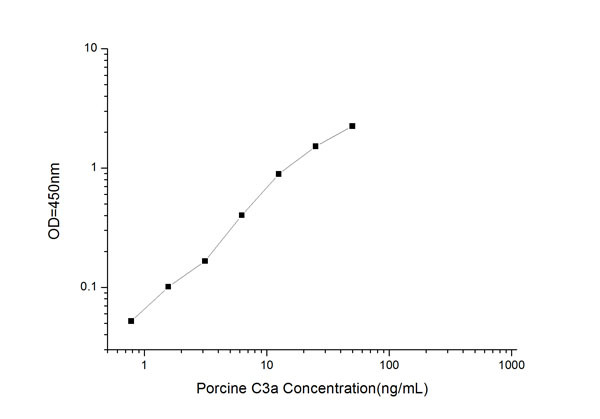 Intended Uses: This ELISA kit applies to the invitro quantitative determination of PorcineC3aconcentrations in serum, plasma and other biological fluids. Principle of the Assay: This ELISA kit uses Sandwich-ELISA as the method. The micro ELISA plate provided in this kit has been pre-coated with an antibody specific to C3a. Standards or samples are added to the appropriate micro ELISA plate wells and combined with the specific antibody. Then a biotinylated detection antibody specific for C3aand Avidin-Horseradish Peroxidase (HRP) conjugate is added to each micro plate well successively and incubated. Free components are washed away. The substrate solution is added to each well. Only those wells that contain C3a, biotinylated detection antibody and Avidin-HRP conjugate will appear blue in color. The enzyme-substrate reaction is terminated by the addition of a sulphuric acid solution and the color turns yellow. The optical density (OD) is measured spectrophotometrically at a wavelength of 450 nm +/- 2 nm. The OD value is proportional to the concentration of C3a.You can calculate the concentration of C3ain the samples by comparing the OD of the samples to the standard curve. NCBI/Uniprot data below describe general gene information for C3a. It may not necessarily be applicable to this product. C3: C3 plays a central role in the activation of the complement system. Its processing by C3 convertase is the central reaction in both classical and alternative complement pathways. After activation C3b can bind covalently, via its reactive thioester, to cell surface carbohydrates or immune aggregates. Defects in C3 are the cause of complement component 3 deficiency (C3D). A rare defect of the complement classical pathway. Patients develop recurrent, severe, pyogenic infections because of ineffective opsonization of pathogens. Some patients may also develop autoimmune disorders, such as arthralgia and vasculitic rashes, lupus-like syndrome and membranoproliferative glomerulonephritis. Genetic variation in C3 is associated with susceptibility to age-related macular degeneration type 9 (ARMD9). ARMD is a multifactorial eye disease and the most common cause of irreversible vision loss in the developed world. In most patients, the disease is manifest as ophthalmoscopically visible yellowish accumulations of protein and lipid that lie beneath the retinal pigment epithelium and within an elastin- containing structure known as Bruch membrane. Defects in C3 are a cause of susceptibility to hemolytic uremic syndrome atypical type 5 (AHUS5). An atypical form of hemolytic uremic syndrome. It is a complex genetic disease characterized by microangiopathic hemolytic anemia, thrombocytopenia, renal failure and absence of episodes of enterocolitis and diarrhea. In contrast to typical hemolytic uremic syndrome, atypical forms have a poorer prognosis, with higher death rates and frequent progression to end-stage renal disease. Susceptibility to the development of atypical hemolytic uremic syndrome can be conferred by mutations in various components of or regulatory factors in the complement cascade system. Other genes may play a role in modifying the phenotype. Increased levels of C3 and its cleavage product ASP, are associated with obesity, diabetes and coronary heart disease. Short-term endurance training reduces baseline ASP levels and subsequently fat storage.